We all have two lives - the life we live and the life of our fantasies. But it is the life unlived - the person we have failed to be - that can trouble and even haunt us. This title delves into the gap between who we are and who we are not, to discover whether not getting what we want may be the unlikely key to the fully lived life. 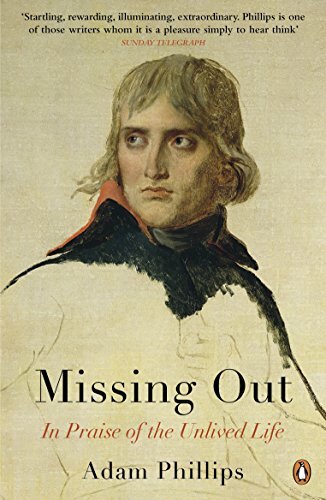 Missing Out is a meditation on reality and opportunity by Adam Phillips. We all have two lives - the life we live and the life of our fantasies. But it is the life unlived - the person we have failed to be - that can trouble and even haunt us. In Missing Out acclaimed psychoanalyst Adam Phillips delves into the gap between who we are and who we are not, to discover whether not getting what we want may be the unlikely key to the fully lived life. Praise for Adam Phillips: '"Phillipsian" would evoke a vivid, paradoxical style that led you to think that you had picked up an idea by the head, only to find you were holding it by the tail' Lisa Appignanesi, Guardian 'He's brilliant' John Carey 'Phillips radiates infectious charm' Sunday Times Adam Phillips is a psychoanalyst and the author of several previous books, all widely acclaimed, including On Kissing, Tickling and Being Bored, Going Sane and Side Effects. His most recent book is On Kindness, which was co-written with historian Barbara Taylor.